This exhibit explores the paintings and metalworks of San Ildefonso artist Awa Tsireh (Alfonso Roybal). Born at San Ildefonso Pueblo in 1898, Awa Tsireh began his painting career in 1917 and by the early 1920s his work was exhibited nationally. Although he received accolades for his paintings throughout his lifetime, less is known about Awa Tsireh’s work in silver and copper. 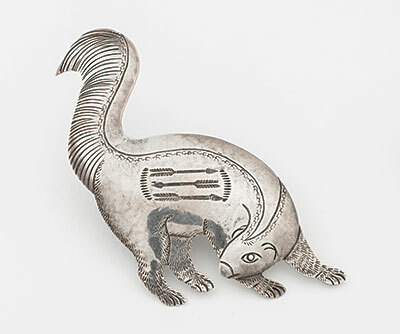 As early as 1930, the artist was spending summers at the Garden of the Gods Trading Post in Colorado Springs where he made whimsical silver brooches and large copper and silver trays decorated with intricate stampwork. 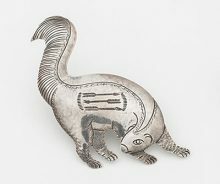 This exhibit will chronical Awa Tsireh’s painting and metalwork career drawing from collections of the Heard Museum, art museums across the U. S., and the collection of Norman L. Sandfield. The exhibit is accompanied by a 140-page catalogue. Our many thanks to the individuals and organizations who helped sponsor the exhibition by adopting an “animal.” If you would like to learn more about the benefits of exhibition sponsorship, please contact Rebecca Simpson at 602.251.0245.